Keeping in with the Jurassic theme, today I paid a visit to the Col de la Faucille, another smaller ski station nestled in a mountain pass on the N5. It is a 20 minute drive from Geneva airport, just past the ancient town of Gex. The N5 provides quite a spectacular drive 3000 ft up the side of a gigantic escarpment with multiple switchbacks and hairpin bends. On this fine sunny morning it was great fun thrashing up in 3rd gear, but to make the same journey on a wild and snowy night would be sheer purgatory. On arrival I made a quick recce of the layout of station on foot and could see that the snow was rock hard and icy, even off piste had an evil sheen. As with other ski stations of the Jura, the majority, if not all of the runs are on the colder North facing slopes. I could tell that it would be a while before any sun would soften the snow. So I invoked a SkiBiker SkiBike Blog protocol which had worked well in 2012, namely, to ski in morning and skibike in the afternoon. The main uplift is by "Telecombi" an unusual chairlift and cable car hybrid, with one gondola per 5 or so chairs. According to a local it was brand new about 4 years ago and would represent a significant infrastructure investment. The chairs are large and detachable, so loading and unloading in safe and easy, unlike some I have been pitched off. There are also a handful of drag lifts serving outlying areas and another chairlift which didn't seem to be working. My first runs were bad enough on my little SnowBlades as I slid, banged and skittered about, all the while struggling to angulate my lower body sufficiently to get the puny edges to grip the slick surface. This would have been lethal on my skibike, possibly a traditional skibob, or the Firem VS would be the only models capable of getting a rider down slopes this slick. Around 11:30 I started to feel some sections start to yield and become more enjoyable. On the next lift, I asked the lifties if one could use a skibike, they had no idea what I meant, but when I said SnowScoot they smiled and said it would be fine. 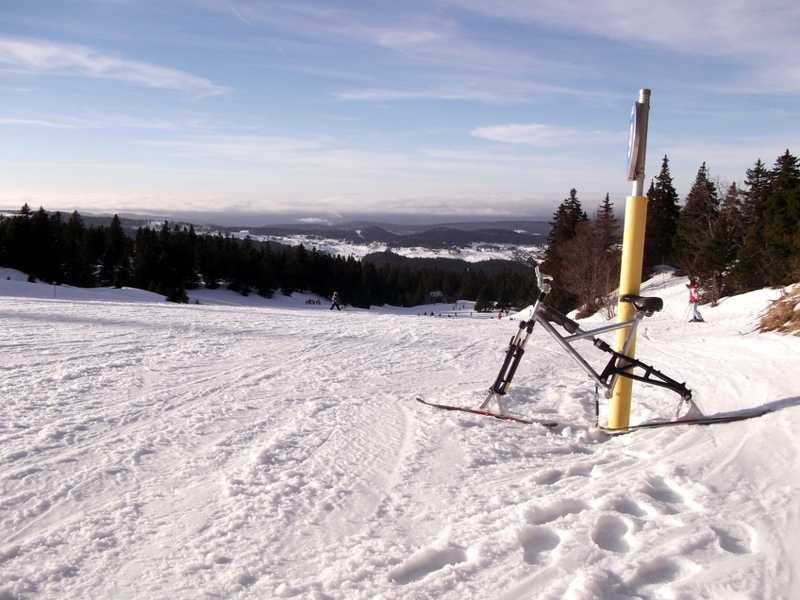 Ski in morning and skibike in the afternoon. After a bite to eat and a change of sliding technology, I headed up the hill. The lifties didn't spot my bandolier, loop and carabiner safety leash and shouted after me. I made the run back down at a relaxed pace and made a point of approaching their cabin and showing them my system. They gave it a quick look over and seemed appreciative and satisfied. For the rest of the day, they seemed very at ease with my presence. 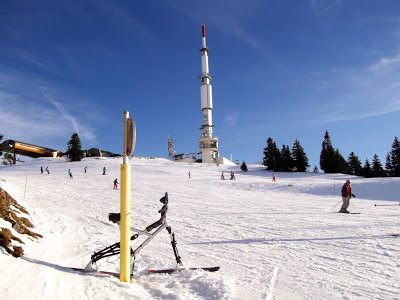 Although limited in scope, La Faucille is a pretty little ski station with nice views to the Alps in the South and the Jura plateau in the North. Both the lifties and the other snow enthusiast were friendly an completely unphased to share the lifts and space on the slopes. No doubt this situation is helped by the presence of an active and growing local SnowScoot club some of whom I keeping meeting. All in, it was a good day out and another new ski station to add to the list of skibike friendly resorts. The cost was a paltry €24, that's £20, what would that buy you back in the UK? An hour or two on a few hundred feet of badly maintained plastic?